Budgets have a big influence on the economy and society. With many countries, about 50 percent of total expenditures and income pass through the budget via taxes, charges and expenditures. In recent years many countries, e. g. in the OECD and the EU, have tended to use this influence in an environmentally rational way. Tradi- tional environmental policy has relied on command-and-control and cnd-olpipc technologies that have proven to be insufficient in coping with the challenge of glo- bal change. Hence, many countries have started to investigate the environmental impacts of their budgets by looking at existing taxes and charges, as well as tax allowances and exemptions and other relevant regulations and expenditures -even to have a special impact on the environment. The implementation of those not meant such findings is now broadly discussed in these countries. This publication will contribute to the debate. 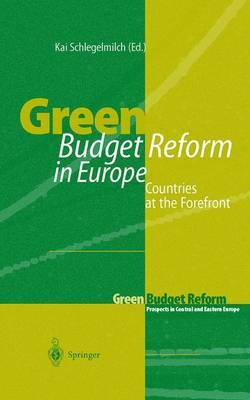 It is a result of a wider project called Green Budget Reform -Prospects in Central and Eastern Europe. initiated by Vida Ogorelec Wagner, managing Director of Umanotera, The Sloven ian Founda- tion for Sustainable Development, and then jointly developed. proposed to the EC and carried out in partnership with Kai Schlegelmich of the Wuppertal Institute in Germany. The project comprised an international seminar on Green Budget Reform in April 1997 at Lake Bled, Slovenia, and the Case Study of Sloveilla.